Did you see some one before who can fly without wings or move without legs? You will answer : definitely no, but I know someone, or better yet some living thing, who can do just both and it is called Borrelia burgdorferi; let’s share its story. It is a loosely coiled bacterium belonging to a class called spirochetes (moving bacteria). Borrelia burgdorferi is motile through the undulation of its axial filaments. It is transmitted to humans by the bite of infected ticks (Ixodes scapularis and Ixodes pacificus) and cause a serious progressive disease called lyme disease. 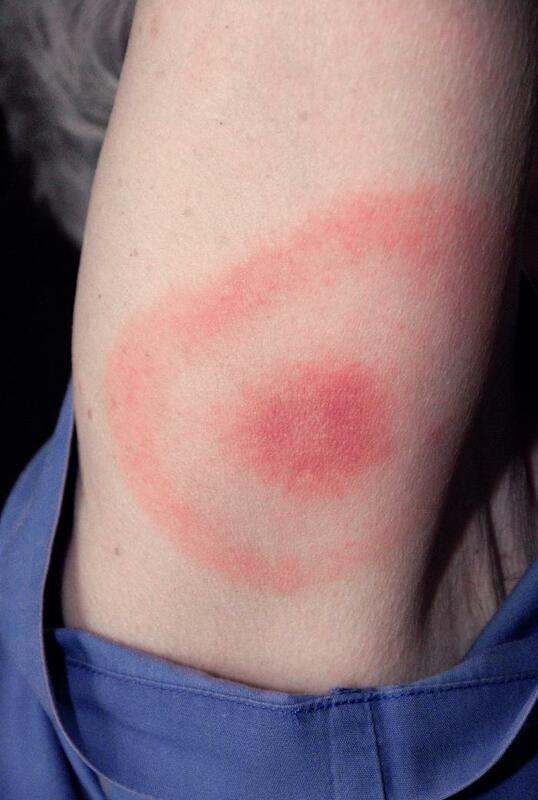 Phase (1): An early localized skin rash, characterized by inflamed red edges with a clear white center at the site of insect bite, appears and is called “erythema migrans“. Phase (2): The rash resolves as the bacteria begin to move into the blood stream towards their target organs like large joints, heart, and nervous system. Phase (3): Inflammation of heart muscle leads to abnormal rhythm, meningitis, confusion and finally arthritis. Treatment in the early phase is an easy mission by amoxicillin or doxycycline, orally for few weeks. However, the recommended regimen in late stages include parenteral ceftriaxone, analgesics to control the severe pain, and anti-inflammatory drugs, usually required for months . Streptococcus pneumoniae is a pathogen normally found in nasopharynx of about 5-10 % of healthy people. Despite its name, it can cause many other diseases as meningitis, septic meningitis, otitis media, & osteomyelitis. a) Polysaccharide capsule: that inhibits phagocytosis. b) Pneumolysin: a protein that causes lysis of host cells & activate complement. c) Hydrogen peroxide: causes damage to host cells. d) Pili: contribute in colonization of upper respiratory tract and increase the formation of large amounts of TNF. Researchers led by Jesús M. Sanz at the Miguel Hernandez University and Maarten Merkx at the Eindhoven University of Technology have now introduced a highly promising new approach for the development of drugs to treat pneumococci. 2) Release of bacterial toxins. 3) Adhesion to infected tissues. If choline is added to a culture of pneumococci, the molecules occupy the choline binding sites of the CBPs so that the proteins can no longer bind to the cell walls of the pneumococci. The bacteria continue to multiply but they can’t separate from each other, these results in long chains of linked cells. Also, the toxin released is stopped. However, choline is not suitable to be used as a drug because an effective dose would be far too high. The researchers thus developed the foundation for a new drug that binds CBP much more strongly than individual choline molecules. The drug imitates the choline architecture of the cell wall by presenting multiple choline groups. This will occupy multiple choline binding sites of the CBP. Also, the required dosage of this CBP inhibitor lies within the range that is acceptable for pharmaceuticals. Meninigococcal meninigits and septicemia are devastating diseases caused by Neissieria meningitidis. Although infants and young children are the most susceptible to the disease, adults are also affected but with less incidence. N.meningitidis is a gram negative capsulated bacterium that has been classified into five serogroups (A, B, C, Y, W135) based on their polysaccharide capsule. Over forty years, developing a vaccine against this dangerous bacterium proceeded with little success. In 1960, the purified polysaccharide antigens were used to develop a vaccine against four groups (A, C, Y, W135) . Unfortunately, this vaccine was highly effective in adults but didn’t give protection to young infants and children who represent the age group most susceptible to the disease. Another challenge is that this vaccine didn’t show success against serogroup B (known as:MenB). Using capsular polysaccharide antigen, as a vaccine against MenB, wasn’t a very good idea. This is due to the fact that MenB capsular polysaccharide is highly similar (nearly identical) to N-acetyl neuraminic acid which is widely distributed in human tissue and that means it is a self antigen. The new vaccine was poorly immunogenic (and thus provide poor protection) and also it might elicit auto-antibodies. As scientists never give up, they switched into the new trend in vaccinology: Reverse vaccinology. Due to the formerly mentioned, N.meningitidis was expected to be a very promising candidate for reverse vaccinology. Using in silico technique (computational biology), the genome sequence was fed into a computer, 570 proteins of the bacterium surface were predicted. Going for more refinement, only 350 of these proteins were successfully expressed in E.coli and and used to immunise mice. The sera assays allowed the identification of certain proteins that elicit bactericidal antibodies and surprisingly, were conservative among different strains and this meets the criteria for a good vaccine. As research is proceeding to deprive our pathogen from enjoying its life inside our bodies, this work suggested further research of other pathogens such as: Streptococcus pneumoniae, Chlamydia pneumoniae, Bascillus anthracis, T.B and group B Streptococcus. A universal vaccine against serogroup B meningococcus. Many drugs can’t do it, but GBS can! Bacterial meningitis is one of the leading causes of death and disability among childrens. Meningits occurs when bacteria cross blood brain barrier (BBB) after interacting with human Brain microvascular endothelial cells (hBMECs) . Although these cells are exhibiting tight junctions and lacking pinocytosis, some bacteria could cross it and this demonstrates an interplay between host cells and some bacterial factors. Scientists at USCD school of medicine used a process involving generating and screening of many group B streptococcus (GBS) in tissue culture model of human BBB (consisting of immortalised hBMECs) . This culture maintained the normal function of human BBB. They identified a gene called iagA gene encoding for a glycosyltransferase. A predicted product of the iagA glycosyltransferase is the glycolipid diglycosyldiacylglycerol involved in anchoring lipoteichoic acid (LTA) and consequently, enhances BBB invasion. Allelic replacement of the iagA gene,so that the resulting mutants are lacking the gene, shed LTA into the media. As a result, mice infected with mutant gene exhibited less mortality rate -up to 90 percent- compared to wild-type infected mice. Mutant-type infected mice developed bacteremia as WT which proves the fact that iagA gene plays the central role in BBB invasion without significantly affecting adhesion or blood survival. Since bacterial meningitis may cause infected children death or many complications as permanent cognitive deficits, blindness, deafness or seizures, an early treatment may help reduce high rates of death and disability. This early treatment may be much more easily designed after these findings by blocking LTA anchoring on bacterial cell surface.This will help preventing meningitis even though bacteriemia has taken place. The journal of clinical investigation has the full story.